Lakeland, FL. May 23, 2017 - A hometown hero returns to bring a little magic to Lakeland, Florida. RP Funding President and CEO Robert Palmer has deep roots in Lakeland. As a Class of 1998 graduate of Lakeland High School (since renamed George Jenkins High), Palmer has shown an unprecedented commitment to the place where he grew up. "I built my first business here. I owe all my success to the people here. Even though RP Funding has expanded down the I-4 corridor in the last 10 years, Lakeland will always be home to me." That commitment to the Lakeland community culminated in the renaming of its largest, most prestigious venue as the RP Funding Center. "When the idea was floated by me, it just made so much sense," says Palmer. "It's been a great ride, and it's just amazing to give back to the community I grew up in. I couldn't be prouder." Originally called the Lakeland Center, the arena has housed premier entertainment for Lakeland residents since opening its doors in 1974. By partnering with one of the fastest growing brands in the United States, the venue is confident their newfound name recognition - along with the funding provided by Palmer - will introduce their services to a whole new audience, as well as bring even more of the nation's top attractions to the community. As part of the partnership, both RP Funding and supporting partner HomeValue.com will help renovate the exterior and interior of the building, as well as promote the venue across their various television, radio, print, and social media platforms. Other real estate-based organizations under the Robert Palmer Companies umbrella - Listing Power Tools, RP Title and Escrow, National Security Title and Escrow, and appraisal management company ARMR - while not official sponsors, will also use their marketing muscle to promote RP Funding Center events. 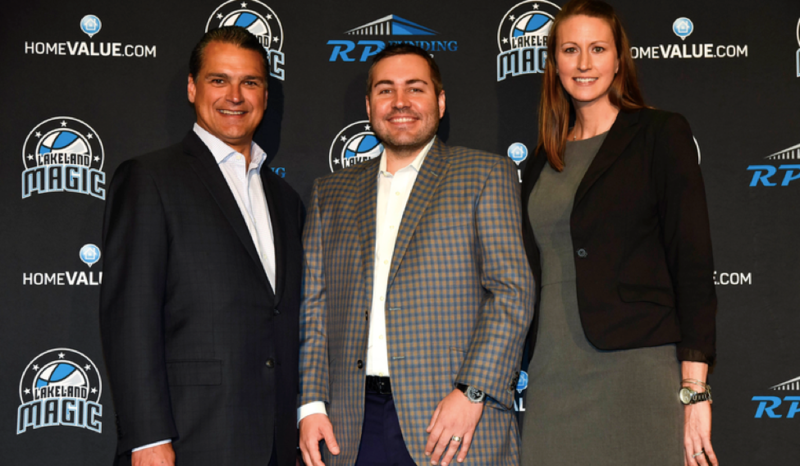 In addition to providing venues for concerts, trade expos, theatre productions, community events, and facilities for GJHS functions, the RP Funding Center will also house the Orlando Magic's G-League (development league) affiliate, the Lakeland Magic. "Even though the Gatorade League is what you would consider the minor leagues of the NBA, we will have Orlando Magic players on the court night in and night out," says Team President Shelly Wilkes. "That's such an exciting thing for this city. It's a very sports-centric city, and we have a lot of support already for our season ticket deposits. We expect that number to continue to grow, and we're really excited to get more of our season ticket holders onboard." The 50-game regular seasons for the Lakeland Magic begin in November and run into April, where playoff teams will participate in best-of-three series format. Tickets can be purchased at the official Lakeland Magic website here.